Coimbra is a relatively small city, which makes it really easy to get around and see the sights on a day trip. Coimbra is a great place to base yourself if you are visiting and want to take day trips further afield into central Portugal. It’s a home of Fado, has a historic centre and modern waterfront. It’s University is the most prestigious in Portugal and a beautiful place, overspilling with traditionally dressed students and oozing rules, history and splendour. Start at the Arco de Almedina, a fortified moorish archway which leads you into the heart of the old town and up the ‘backbreaker’ steps. We started here as once you’re up, you’re up and it’s over and done with. We carried both of the kids and even Grandma managed the steps without too much huffing and puffing, so I can’t really say they live up to their rep.
On your way up you can stop by the Se Velha, the Old Cathedral of Coimbra, a Romanesque cathedral with a few gothic touches and hints of Islamic architecture thrown in for good measure. It dates back the late 12th Century, when Coimbra was the capital of Portugal and is therefore fittingly opulent. It’s not quite as ornate and gold-leaf ‘bling’ as a lot of the newer cathedrals but is Portugal’s oldest surviving untouched Romanesque cathederal I loved the intricatly carved stone and woodwork. If churches are your thing then it’s a must, if you appreciate architecture then it’s worth a visit for the €2.50 entrance free, kids are free. Heading on up the hill to the pinnacle of the aptly named ‘Upper Town’, through the winding cobbled streets, continue onto the University (Universidade de Coimbra). Which, if you have limited time in Coimbra, is THE place to go. It costs a pricey €9 entrance fee for adults, but free for under 12’s and worth the splurge. A UNESCO’s World Heritage Site since 2013, it’s simply stunningly beautiful. The bleached white stone of the imposing buildings in the bright Portuguese sunshine is a sight worth seeing. In a domineering position on top of a hill, you are afforded great views of city and the Mondego River below. 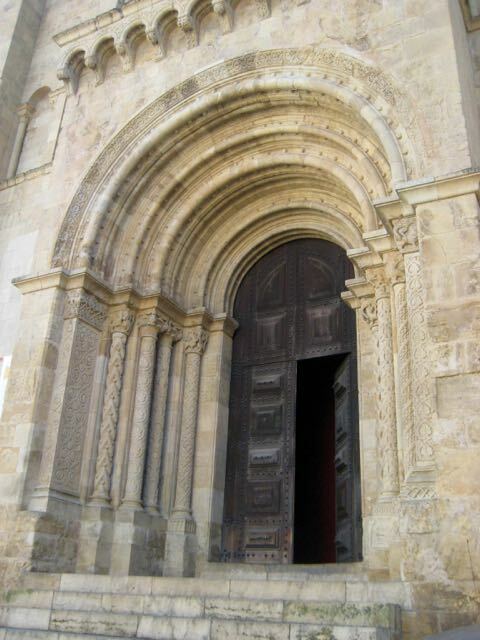 You enter the The Palace of Schools through the monumental archway, the Porta Ferrea, situation on the same site as the main gate to Coimbra’s moorish walled city. The large patio, Patio des Escolas, is wide-open safe place for the kids to run around and look at the huge statue of Joao III. You can pay extra to access more of the University’s buildings, best to check here, if you are interested. The 18th Century Clocktower is the focal point of the patio, as are the mirrored central steps. You can weave your way in and out of the buildings, visiting the ornately decorated Chapel, Great Hall of Acts and Private Examination rooms to name a few, access is clearly signposted. The University is a working uni, and you will encounter traditionally garbed students who you instantly feel sorry for having to endure any kind of hot Portuguese sun, with their antiquated black gowns and suits. My highlight was the Baroque Library, you are unable to take photos and have to enter at the set time, provided on your arrival, as only 60 visitors are allowed in any one 20 minute slot. It’s Europe’s richest library and you can tell. It oozes opulence and extravagance. It’s jam packed full of law, theology and philosophy books, steeped in history, some over 500 years old and a stunningly beautiful space, full of ornately carved Jacaranda wood. The kids favourite place was the Academic Prison, of course! A floor below the library, there are small cells with heavy doors for exam cheats, truants, late library books and students who got caught smoking behind the bike sheds 🙂 A great place for hide and seek, peekaboo and whispering echo! You could spend a good few hours in the Uni but we had hungry kids, so after the library we walked around the corner to find the Science Museum and had a bite to eat in it’s reasonably priced child-friendly cafe. The University’s Science Museum (Museu da Ciência) is small, in fact, just two rooms, tiny in comparison to the likes of London or other cities in Europe. We lucked out and ended up getting in free but there is usually a small charge. It does include a range of interactive experiments and hands on displays. Chaos’ favourite was the hot air balloon, press the button, it fills with hot air and then takes off and hits the ceiling, he didn’t want to leave! Coimbra does have another Science museum, the Exploratory Living Science Centre (Exploratório – Centro de Ciência Viva). Over the river from the centre, it is much larger and more in synch with it’s european counterparts, check out their website here. There are many more amazing sights in Coimbra, particularly the Museu National de Machardo de Castro, a must see if you have the time. Visit their website here. Also the Portugal dos Pequenitos, Mini-Portugal Theme Park, which has mini replicas of the important buildings and structures from throughout Portugal, their website is here. Enjoy Coimbra, a perfectly aligned mixture of old and new, the laid-back capital of Central Portugal. Thanks for your feedback Ahila, Coimbra really is a great day out! Thank you. Central Portugal isn’t very well known but Coimbra and the area have so much to offer. Thanks for your comment and the linky! © 2017 www.topsyturvytribe.com. All rights reserved.